The Department takes reference from the design of international IEEE/ACM institutions; the Program is comprehensive, rich and contains many special features, such as grouped program, experimental program, and graduation project implementation. It also places emphasis on hands-on practical work, programming design and creativity cultivation. 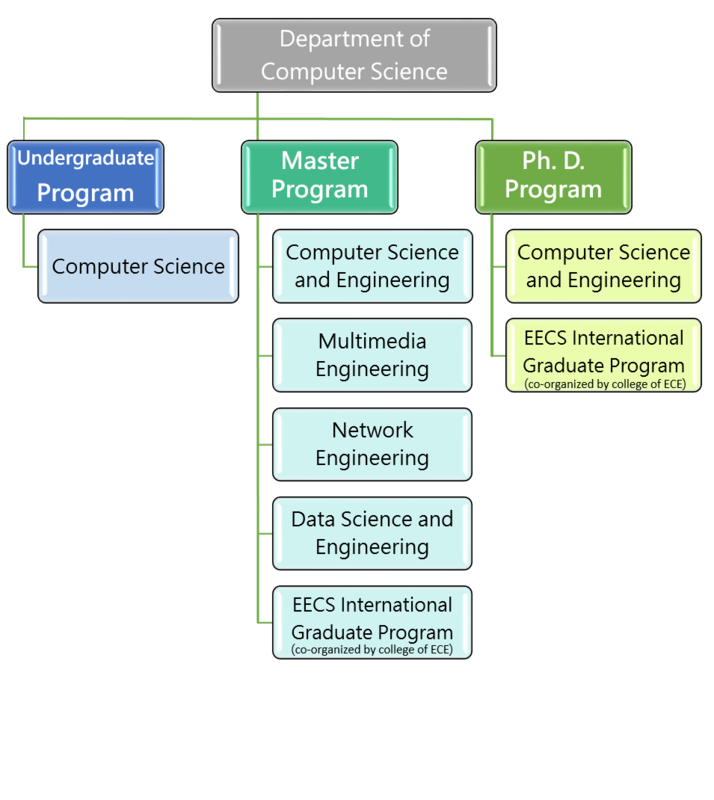 The Department divides the Computer Science Undergraduate Program into three programs based on fields: The CS + EE Program integrated information and engineering specialties to lay down a solid knowledge base for the students. The Computer Science and Engineering Program cultivates students to become experts in systems design and software development. The Network and Multimedia Engineering Program stand at the forefront in the trend of advanced communications and multimedia, seizing the future trend of internet multimedia technology. The various program designs aim at balancing both theoretical and technical knowledge, while at the same time emphasizing the coordination of theories and practices. The Department boasts many research projects; 3rd and 4th year students not only are required to take the special topic design programs, but also have many opportunities to participate in the industrial and research projects of teachers and graduate students. During their 3rd and 4th year, students can apply to go on an exchange program to one of the top partner international universities for a period of one semester or up to one year, to gain a profound understanding of different foreign learning cultures and to broaden their horizons. Students with outstanding achievements will also have the opportunity to receive the privilege of being awarded an exchange student scholarship. The course planning of the Electrical Engineering and Computer Science Undergraduate Program jointly held with the College of Electrical and Computer Engineering is in accordance with the Department of Education's "Revision and Integration Project of University and College Electrical Engineering and Computer Science Curriculums", incorporating a flexible and diverse credit system. The students can also participate in summer holidays short-term internships and foreign exchange student learning. Teaching in small classes also allows the students to receive more resources and is favorable in the application to complete a master's degree within 5 years. The Institution is established for the purpose of cultivating high-quality Masters and Ph.D. students to be engaged in the research and development of advanced information technology and enhancing Taiwan's position in the global information industry. The professors of the Institution are divided into several fields of study, maximizing the power of integration and increasing interdisciplinary cooperation. In addition, the Institution hires international scholars to teach at the facility, recruits international students and strengthens international cooperative relationships, in the hope of contributing to the research and development of the computer science field. In recent years, industries such as the internet, mobile communication, e-commerce, and wireless communication have seen vigorous development; internet applications and mobile communications have become a part of our daily lives, proving that the development of related industries is limitless. Therefore, enterprises are actively becoming involved in research and development, and there is an urgent demand in the industry for network hardware and software R&D talents. This Institution provides an excellent research and development environment, interdisciplinary resources and R&D technology; it supports the integration of the internet, communication and information technology, in order to promote internet applications and accelerate industrial development. In modern society, we often come in contact with information presented in multimedia, and often use multimedia to interact with the outside world, for example, computer and internet games; animations; fingerprint, voice and handwriting recognition; video surveillance; digital AV; digital learning, etc. The Institution has established a comprehensive and professional program, creating a unique learning environment to provide the opportunity for more breakthrough achievements in research as well as to foster in our students specialized knowledge and abilities. The teachings of the Ph.D. program of the Department not only contain professional and sophisticated knowledge in this field but also place great emphasis on the development of innovative thinking, generalizing and problem-solving skills on the part of our students. It is hoped that our students will possess execution and leadership capabilities during team cooperation and planning, be able to engage in independent research and have the perseverance to achieve the goal of lifelong learning. The Department's Ph.D. students often travel abroad to participate in large-scale international conferences, publish academic papers and also visit foreign academic research units for mutual exchange. Not only have our students been awarded a number of awards for outstanding papers, but they also produced dazzling results in computer science and information-related competitions, as well as in applications for international scholarships. The Ph.D. program of the Institute of Computer Science and Engineering possesses abundant educational resources, with over 70 full-time professors and a number of international world-renowned visiting professors, providing a complete and sound environment for interdisciplinary research. A number of scholarships are provided for the participation of Ph.D. students in projects and internships. The Ph.D. students of this Department have wide employment opportunities, with outstanding academic and industry performance both at home and aboard. According to the analysis of the WOS database set: Essential Science Indicators (ESI) by the American Institute of Scientific Information, the number of computer science-related papers published by the University in recent years ranged between 20th and 26th in relevant academic institutions around the world. The alumni have rich social contacts within the industry and are commonly in close proximity to the Hsinchu Science Park and the Industrial Technology Research Institute. Many world-renowned technology enterprises provide internship opportunities to our Ph.D. students, increasing their practical exercises opportunities and deeply enriching their self-capabilities and strengths. This program is jointly held by the College of Computer Science and Academia Sinica; the students are under the guidance of top teachers from the College and Academia Sinica. Not only are they able to use the research environments from both institutions, but also to learn from the research expertise of both parties, putting into play synergistic effects in the cultivation of talent to nurture elite and highly skilled talent with both network and computer science professional integrated capabilities. Academia Sinica provides to the students of this program scholarships of a maximum of NT$ 24,000 per month, which can be renewed for up to two years depending on the student's academic performance. In response to the international development of the University, the College of Computer Science and the College of Electrical Engineering have jointly established the "EECS International Graduate Program" responsible for the education and research resources of international students. The program provides the students of both colleges a complete program taught entirely in English; it is responsible for the formulation and discussion of English teaching matters as well as relevant provisions. On one hand, the program will attract outstanding foreign students to come and study, and on the other hand, enhance the international perspective and global vision of domestic students, in order to cultivate globalized talent in electrical engineering and computer science.